Glass Reinforced Plastic Piping Market size was over USD 5.8 billion in 2017, with projected gains over 5% CAGR between 2018 and 2024. With the ever-growing need for energy and water resources, global piping industry is growing rapidly and at the forefront of this development, has been the evolution of fiberglass. Demand for high-quality glass reinforced plastic (GRP) piping has been observing an upward trend in the recent years. These pipes exhibit exceptional fatigue-resistance, adhesion, impact strength, low shrinkage and chemical-resistance which lead to their long-term performance. The last decade observed significant substitution of metals by GRP pipes, as they tend to be about 4 times lighter than steel and 5 times lighter than the ductile pipes. The livelihood of the future will entail smart buildings, smart energy, smart mobility and smart pipe technology. According to Strategic Energy Technology Information System, EU, between 2015 and 2020 an additional 1500 MW of small hydropower capacity will be installed in Europe alone. This is likely to result in a robust demand for pipes every year, presenting significant potential for glass reinforced plastic piping market by 2024. It is predicted that almost 70-90% of drinking water pipeline breaks occur dur to corrosion. These failures befall usually without warning and sometimes after a surprisingly short period of exposure. The consequences of corrosion can cause severe damages on drinking water mains. The ductile iron and steel pipes walls tend to be thinner and involve much shorter time to break, thus requiring expensive maintenance and monitoring. GRP piping market will witness substantial gains by 2024, as the product serves to be the suitable means of the corrosion problems. These pipes reduce the maintenance costs as they do not rust and need minimal or no protection from the environment. An increased demand of glass reinforced plastic has led to high volumes of manufacturing scrap. Restrictions on landfill disposal and the involved high-energy requirements for production of virgin material might pose as threats to the market growth by 2024. However, with the unchanged hydraulic characteristics, GRP piping result in significant reduction of CO2. For instance, the industry giant Amiblu recorded savings of 376,734 tons of CO2, in Czajka wastewater treatment plant in Poland. The project involved the trenchless installation of 7 km of centrifugally cast GRP sewer jacking pipes. The environment friendly traits of the product will drive the overall glass reinforced plastic piping market by 2024. Global glass reinforced plastic piping market was led by epoxy resins in 2017. Epoxy resins possess the superior qualities in contrast to those of polyester and vinyl ester resins. The aromatic groups make epoxy resins about three times stronger than others and the cross-linked structure further ensures their thermostability and impact resistance. However, high costs associated with these resins may restrain their demand to some extent in the future years. Vinyl ester segment is likely to witness a fast growth with CAGR close to 5.5% in global glass reinforced plastic piping market over the forecast timespan. These resins are particularly useful for industrial application more aggressive environments where specific chemical resistance is needed. Vinyl ester-based glass reinforced plastic piping will observe an escalating demand in the chemical sector by 2024. In case of the potable water systems, the water safety is of utmost importance; it is essential that the water is not exposed to any modification that may be harmful to health. GRP pipes do not get corroded, involve the minimized hydraulic loss in potable water pipelines and are considered to be the ‘greenest pipes’. The product is likely to observe a steady growth of over 5% CAGR in the water supply area of application in global glass reinforced plastic piping market over the forecast period. In 2017, the oil & gas segment held the highest share exceeding 30% in the overall glass reinforced plastic piping market. These pipes will observe strong demand in a range of applications in oil & gas sector including: exploration, refinery piping, crude oil transmission, sub-sea piping, etc. Few other significant applications have been: offshore platform piping, injection lines, gas transmission lines, off-loading and floating production storage. 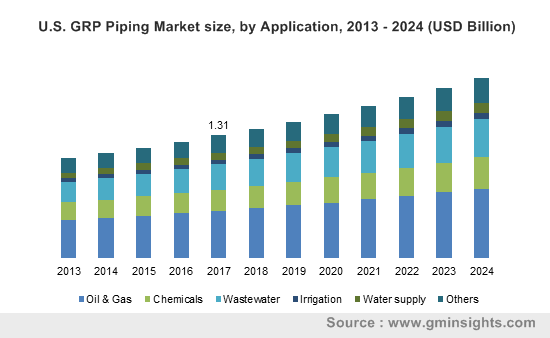 Producing oil & gas, fracking for shale gas and growing biofuels are highly water intensive areas and will hold the potential for GRP piping market by 2024. 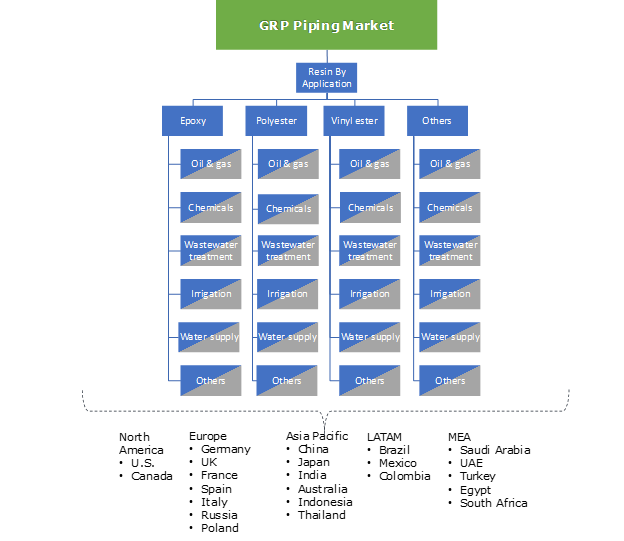 Following Asia Pacific, North America was the second highest region in global GRP piping market in 2017 with a share over 20%. Development of horizontal drilling and hydraulic fracturing technologies made a significant amount of unconventional hydrocarbon reserves in the U.S. For the next decade, the region will remain the leader in terms of growth in production of liquid hydrocarbons, thereby portraying brighter growth aspects for the glass reinforced plastic piping market in the forecast period. The Middle East & Africa will observe the fastest growth in global glass reinforced plastic piping market by 2024. Few projects with successful installation of GRP pipelines in the region include: Shauliba desalination plant and Ras Al-Khair desalination plant in Saudi Arabia, Aydin Kocarli-Bagarasi Irrigation Project in Turkey, Rwimi hydroelectric power station in Uganda and many more. Glass reinforced plastic piping market players have been collaborating with the research institutions for discovering bio-based GRP. The product could be investigated to have either the polymer matrix or the reinforcement fibers, or both originated from renewable resources. Key industry manufacturers include: HOBAS, Saudi Arabian Amiantit Company (SAAC), Fibrex, Future Pipe Industries, Smithline Reinforced Composites, etc. Industry giants have been striving to enhance their global footprints which will lead to the intense industry rivalry in the future years. For instance, Amiblu, the joint venture of HOBAS and SAAC, pipes have invested significantly in hydropower schemes in difficult to-access areas of Sri Lanka, Chile, Uganda, Norway Scotland, Iceland and Alpine. The trending industry innovations include: using couplings to eliminate the need for fittings, short pipes to reduce the number of thrust blocks and bends and the use of long-drawn curves that facilitate the hydraulics. Glass reinforced plastic pipes are made from glass reinforcements that are embedded in cured thermosetting resin. GRP invaded the piping industry due to its corrosion resistance capabilities and have been preferred as alternative to steel and stainless-steel pipes.